The record for the lowest scoreline at the tournament was set by a 2-0 win for Argentina over Spain in 2008, and later equalled by a 1-1 draw between Ukraine and Mexico at Ravenna 2011. In this latest low-scoring encounter, the first two periods remained goalless before Joe Luwi scored for the Solomons in their first match at a FIFA tournament on Oceania soil. The first period had included several narrow misses, with Netherlands’ captain Patrick Ax clipping the crossbar with a snap-shot, while Solomon Islands had an effort cleared off the line. In the second third, Netherlands’ wing Charlie Van Den Ouweland struck the crossbar with a sweetly struck volley but the scoreline remained blank – the first time the tournament witnessed two consecutive scoreless periods. A goal was starting to look unlikely until Solomon Islands’ wing Luwi finally broke the deadlock early in the second half. Even his goal had an ounce of luck, bouncing over the arms of diving Dutch goalkeeper Frank Van Der Geerst. Nicholas Muri then made it 2-0 for the Solomons, securing the points, with a glancing header with three minutes remaining. Gideon Omokirio, who now has his first win in a World Cup match as coach says that he is relieved and happy with the result. “I am very happy with this important win – it was a very exciting match especially as this is my first World Cup win. Am really proud of the boys’ performance and how they worked hard in this game and deserve the result,” says Omokirio. 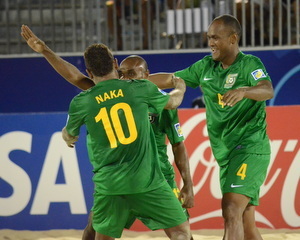 A veteran from four FIFA Beach Soccer World Cups Omokirio says that it came down to will power and who wanted the result more. “We quickly learnt the direction that the Netherlands wanted to take the game so we worked hard to minimise the threat they posed. We went about it by keeping them under constant pressure and did not give them time to play like they wanted to,” says Omokirio. The Bilikiki will meet South American powerhouse Argentina in their second match on Saturday 21 September.